Gain % (10-11%) of Non-Chaos Damge as Extra Chaos damage (prefix) - This only can be obtained by unveil system. EDIT: You can check the first post (guide) and check the rare item section, there's an example with a finished crafted weapon. EDIT #2: Now you have to see if you want to keep this weapon or sell it later, lot of builds don't stack castspeed (example: trap builds) so would be better to craft the crits! EDIT 3# There's also unveil prefix like (gain % cold damage as extra chaos damage) and other similar things. EXTRA NOTE: To make it clear, you don't need a perfect weapon for this build to shine. I guess you already saw for yourself that you can kill T15 trash with oneshot and bosses rather easy with only 1 mod weapon. So whatever you decide to pick, don't worry to much. You don't need to craft all mods today. Thanks a lot for your excellent reply. I want to keep the item for my totem char so I will craft cast speed, if that's the best choice to get on it. 1. 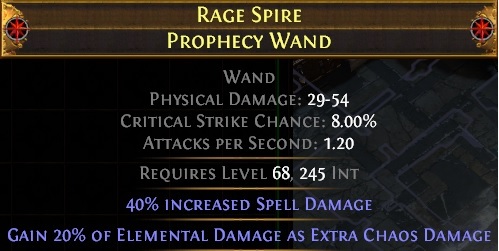 Would flat spell damage be better dps from spell dmg + non-chaos as extra dmg? 2. Would crit multi be better than global crit multi? 3. You say crit multi > crit chance. It feels weird because I barely have any crit chance on my items so multi wouldn't be as useful, right? 4. If damage to spells is something to go for, which type of spell damage would be the best in terms of dps? So for example, if I add 50-100% crit chance, in reality we only adding a few crit chance to our base stat. This being said, we can now see that adding crit chance only raise a few %. But if you add Global Crit Multi, you crit damage will be much higher. I'm not a big fan of flat damage to spells, and if you check Sambar / Void Scepter (poe.trade) you will see almost everyone don't craft flat spell damage. For the prefix I didn't learned yet the non chaos / cold % mods, so i'll have to wait to see what I get first. Also: I don't think 4% chance double damage is good enough. should i remove the phys to fire dmg? I wanna ask how projectile weakness compare to frostbite? what should i upgrade next? got 18ex budget. Pandemonius can not be underestimated defensively, but apart from that I don't think there is any substantive enhancements. You could rejig around Atziri's Reflection (cheapest 23EX atm), but you'd lose the extra totem and damage, though could gain at least some damage back as you could get more offensive rings. i still feel like my damage is so lacking :/ what can i improve? my tooltip shows me hitting at like 136k but it feels like i do no dmg to bosses. attempted guardians and just got mauled.